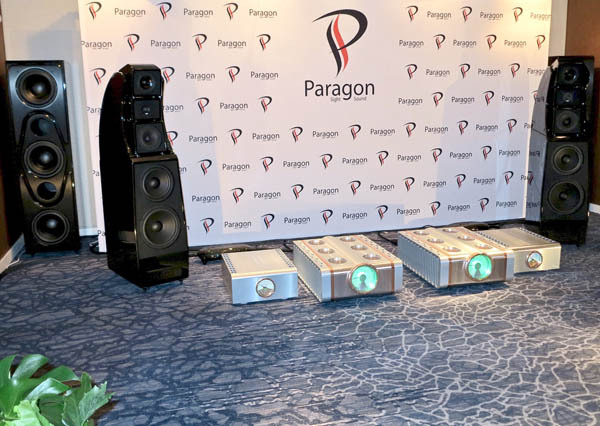 Given that I had recently gushed over the pairing, at one of Definitive Audio of Seattle’s Music Matters events, of Wilson Audio’s Alexx speakers ($109,000/pair), Sub Sonic Subwoofers (two, at $37,500/each), and Watch Controllers (two, at $4000/each); D’Agostino Relentless monoblocks ($250,000/pair) and Progression monoblocks ($38,000/pair), plus Momentum phono stage ($28,000); a dCS and Clearaudio front end; and lots and lots of Transparent Reference XL cabling plus an HRS VXR-19213V-80 rack with two M3x base audio stands ($57,960 total), I didn’t know if I would hear much of a difference from the AXPONA system put together by Michigan retailer Paragon Sight and Sound. If anything, I expected the level of sonic excellence to drop somewhat, because we were moving from a purpose-built, carefully treated store showroom to a far more challenging convention hall space. Oh, was I wrong. Although, on the dCS end, the system moved down a small notch by the replacement of the four-stack Vivaldi system with this room’s not exactly shabby Vivaldi One ($92,000 with special nickel finish), there were two notable system additions: the brand new D’Agostino Momentum HD Pre Line Stage ($40,000), which I’m in line to review, and the Stromtank 2500 Independent Power Source ($19,500). Together with Clearaudio’s Master Innovation Turntable with TT1-M1 tonearm ($54,000) and Goldfinger Statement cartridge ($16,000), this system made music like no other system I’ve ever heard. When I entered, Musical Surroundings’ Garth Leerer was playing “If I Should Lose You” from jazz ensemble Sphere’s LP Flight Path. The bass was solid beyond belief, the control absolute, and the tactile sensation of sticks and brushes touching the skin of a drum positively uncanny. No booming, absolutely no booming, whether from deep drums or double bass. No sense of a separate subwoofer or, on a file of an organ track cued up by Peter McGrath, an iota of strain. None. And the spaciousness was extraordinary. One more: McGrath’s 24/88.2 live recording of a performance of Bernstein’s Chichester Psalms, on which the system’s ability to separate the sounds of individual voices in a massed choir was beyond compare. I sat in total awe. If I hadn’t been covering an audio show, I would have joined the group of people in the first row who had returned to this room for a second day, and were occupying all the best seats for as long as they could. Smart people, with the ability to recognize a system, conceived by brilliant designers, that can make reproduced music sound like the real thing.